Warning! Winter Kristy is not someone you want to be around. She's whiney, mopey, cold and often in a zombie like state. Please keep far away until the temperature reaches above 20 degrees celsius. No seriously. If given the opportunity to hibernate like a bear during winter, I seriously would. If seasonal affective disorder does actually exist, I'm confident I have it. Luckily, autumn and winter are only half the year and spring (our favourite season!!!) is now here! Now that the weather is warming up, we are back to our cheerful happy selves and enjoying doing as much as possible with all the free time we have. One thing we love to do in the warmer months is entertain friends. Whether it be a casual lunch by the pool to cool off or a dinner party in the evening, it seems like there's always at least someone new at our house each week. 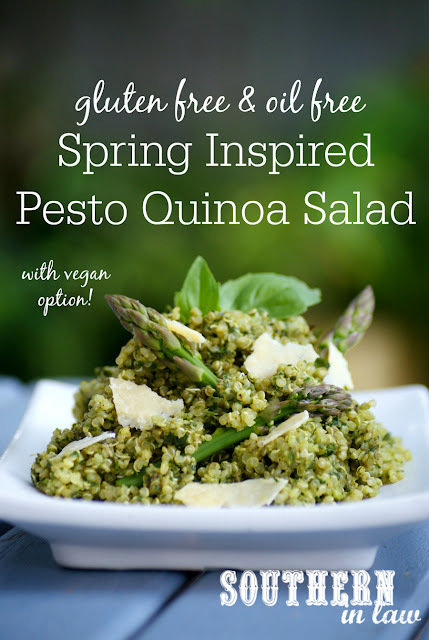 When our friends at Tefal challenged the Cuisine Companion bloggers to come up with a Spring inspired recipe, I knew I had to come up with a delicious dish that would be perfect for entertaining - and that I did! 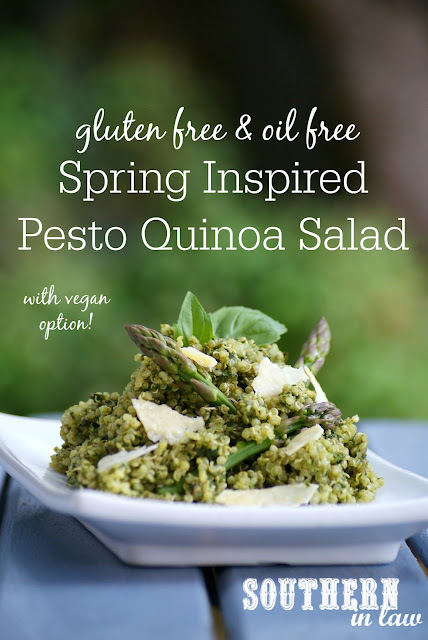 This Spring Inspired Pesto Quinoa Salad is super easy to make and incredibly versatile - but it tastes so delicious your friends will be waiting for your cookbook to hit the shelves. It can be packed up for a spring picnic or served up at your next dinner party as well as prepped for lunches during the week. Best of all? It suits a wide variety of food needs and can be easily adapted to suit your guests - whether they're gluten free, vegan or in need of a low fat, oil free option! So I better stop yapping and get to what you came for, shouldn't I?! Cook your quinoa as per the package instructions and set aside. Whilst your quinoa is cooking, add your cashews to the bowl of your Cuisine Companion, fitted with the kneading/crushing blade (or your food processor). Process your cashews on speed 10/medium speed until coarsley chopped. Add in all of your other pesto ingredients, except for your water, and process on speed 8/medium-low for 1-2 minutes, stopping scraping down the sides inbetween to ensure everything is incorporate. Whilst your Cuisine Companion/food processor is going, slowly add your water 1 teaspoon at a time, until your desired consistency is reached (we added about 1 tbsp of water). Season to taste and mix your pesto through your cooked quinoa. 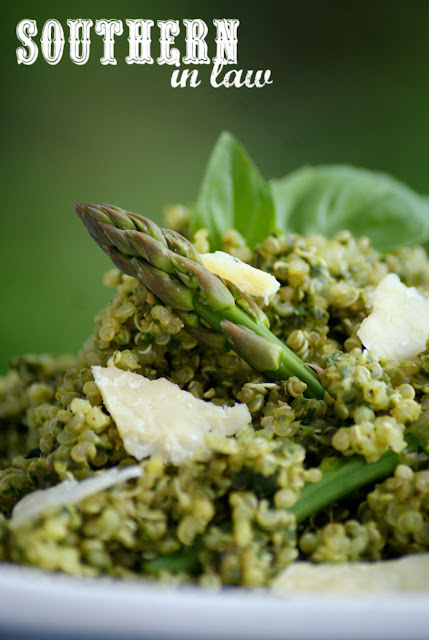 If desired, add in some delicious spring vegetables (we like adding in Healthy Sauteed Grilled Asparagus) or some sliced grilled chicken or spring lamb to make it more of a meal. *The amount of servings will depend on how you're serving it! If serving this as a main, you'll find you get around 4-5 servings, whilst as a side dish it will serve around 8 adults! **Instead of cashews you can use pine nuts, walnuts, sunflowers seeds (nut free option) or whatever nut your heart desires. I wouldn't really suggest using peanuts, however! But tell me, what's your favourite season? And what's your favourite thing about spring?